Lots of links to his writing here. Specifically, check out the letter mentioned above, written from an island within the Indonesian archiplago, that formed his share of the Wallace/Darwin papers read at the Linnean Society on July 1, 1858. This is the document with which Wallace established his independent invention of the basics of the theory of evolution by natural selection for which the greater credit (rightly, IMHO– and that of lots of other more competent writers) goes to Darwin. Much more to come, I hope, from many sources. In this the Darwin year, it is a necessity, I would say, to recall the deep thinker and truly great naturalist who both worked out a genuinely new idea about nature. *This isn’t to say the The Descent isn’t an important book. It is, of course, especially in its explicit inclusion of our species within the evolutionary framework. It is to say that the endless accumulation of detail on sexual selection, though impressive and ultimately convincing (in the “I surrender” mode of winning argument srategies), is damned tedious to read. In conclusion I would only wish to add, that my connection with Darwin and his great work has helped to secure for my own writings on the same questions a full recognition by the press and the public; while my share in the origination and establishment of the theory of Natural Selection has usually been exaggerated. The one great result which I claim for my paper of 1858 is, that it compelled Darwin to write and publish his Origin of Species without further delay. The reception of that work, and its effect upon the whole scientific world, prove that it appeared at the right moment; and it is probable that its influence would have been less widespread had it been delayed several years, and had then appeared, as he intended, in several bulky volumes embodying the whole mass of facts he had collected in its support. Such a work would have appealed to the initiated few only, whereas the smaller volume actually written was read and understood by the educated classes throughout the civilised world. 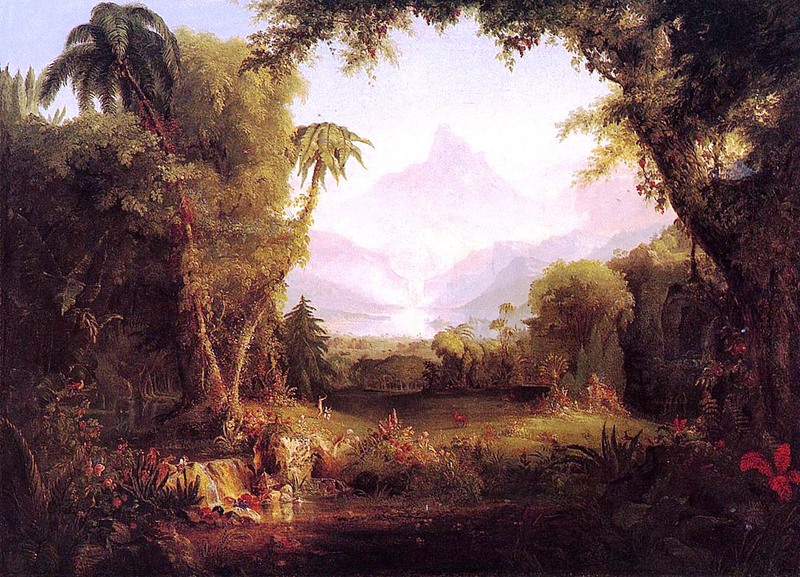 Image: Thomas Cole, “The Garden of Eden” 1828. Maybe it’s just me, but I think Cole had a tropical island in mind as the model of his paradise. This entry was posted on January 8, 2009 at 3:51 pm and is filed under Darwin, evolution, Priority. You can subscribe via RSS 2.0 feed to this post's comments. You can comment below, or link to this permanent URL from your own site.